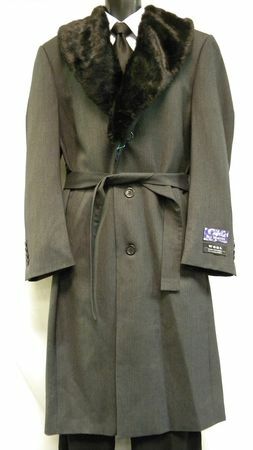 Here is Full Length fur collar top coat with some serious attitude. The removable faux fur collar can unbutton and you can wear it with the velvet chesterfield style collar underneath. All ready for you to improve your image. You don't have to be King Jaffe Joffer of Zamunda from the movie "Coming to America" to wear one of these but You'll Certainly look like a King wearing it. This gray tweed top coat is made by Blu Martini by Falcone and features a top coat weight fabric with a herringbone pattern that is similar to suit style fabric and has a soft cashmere like feel. Please note that coat is a fall weight. Fabric is made of Poly/Rayon/Wool.